of nature and of human nature. taking us with them into the poles of our own natures. A concrete poem is one that takes the form of what it describes. I could find no photo of a rose in my photo library, so the form of the poem will have to do to illustrate its meaning. This entry was posted in advice, concrete poetry, Form Poem, Judy Dykstra-Brown poems, Poem, Poems, Uncategorized and tagged concrete poetry, Daily Post, Daily Prompt, form poetry, Poem about how to deal with life's cruelties, Roses on January 27, 2017 by lifelessons. My neighborhood gang. 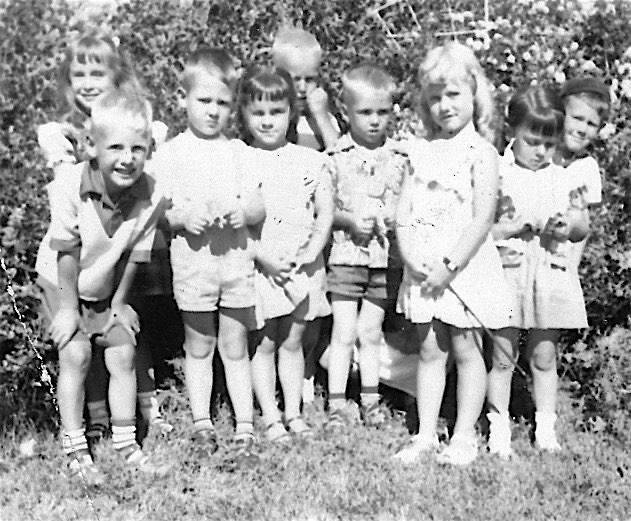 I think we were all five or six years old. 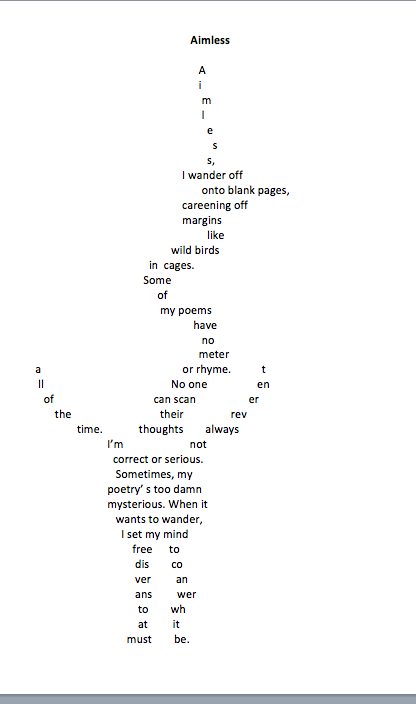 I did the above poem making use of a screen shot, but I’m not very happy with the quality. I need to leave to go to Guadalajara so can’t fuss with it more, but when I get home will go back to my old method of printing it out, making a jpg file and posting it as a photo from the media file. Back to the drawing board! 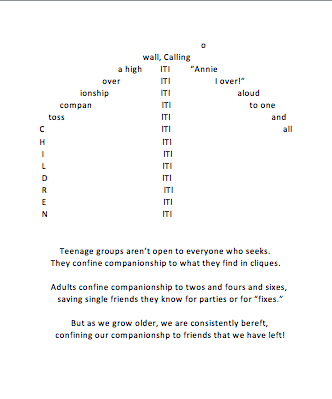 This entry was posted in concrete poetry and tagged companionship, concrete poetry, Daily Post, Daily Prompt, poems about friends on June 21, 2016 by lifelessons. Here’s a smaller version so you can see the shape on a smaller device. I’ve been working on this shape for seven hours. Sheesh! how time flies. I have versions of four different birds, but I think I like the duck best. In case you are curious, here is another version of “Aimless.” Same poem, different bird–a plumed exotic with its wings extended. 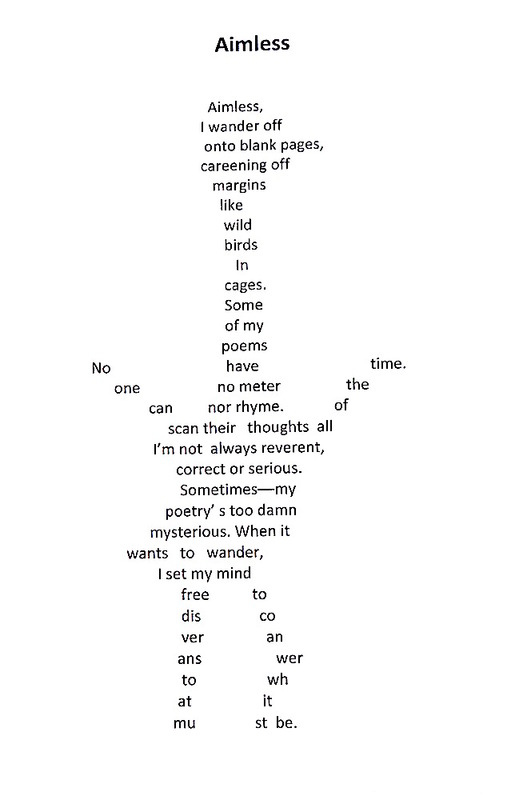 This entry was posted in concrete poetry and tagged aimless, concrete poetry, Daily Post, Daily Prompt, Intuition, poem about the subconcious mind, Shape Poetry, subconscious on June 19, 2016 by lifelessons. All bear them as badges of life. Each marks a wound and then a healing. that we all face––the cut, the gore, the severing. pain with healing, one way or the other. in us all that needs smoothing. For the past year, I keep getting these heart-shaped wounds on my arm. I think they are from the dogs jumping up on me or from wounds won trimming the bougainvillea, but it is amazing how many times they are in a heart shape. I’d already written this poem before I decided to try to make a concrete poem out of it. As I progressed, it wanted to be a heart. This entry was posted in concrete poetry, Poem, Poems, Poems about aging, Poems about problems, Shape Poems, Uncategorized and tagged concrete poetry, Daily Post, Daily Prompt, Family, poem about scars, poems about death, poems about injuries, scars on May 1, 2016 by lifelessons.